Razer's 2016 BlackWidow Ultimate is the epitome of an incremental upgrade. And that's totally fine. The Razer BlackWidow Ultimate 2016 Edition ($100 and available on Amazon) is the epitome of an incremental upgrade—and that’s absolutely fine. Take the totally competent keyboard we saw in 2014, make a couple of smart tweaks, and put it back on the market. So what are those smart tweaks? I’ve identified two small but notable changes. Namely, no macro keys and a refined Num Lock / Caps Lock / Game Mode indicator tray. 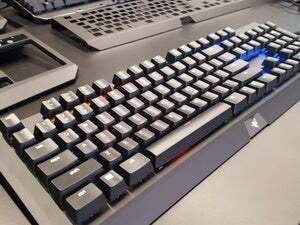 Per the first: The 2014 BlackWidow Ultimate (and RGB-enabled BlackWidow Chroma) had a column of five macro keys arrayed down the left side of the board. They’re gone. There are no dedicated macro keys on the 2016 BlackWidow Ultimate. That’s surprising, given how long macro keys have been a standard feature on gaming keyboards. For Razer—which made its name on gaming peripherals—to eliminate them means it's following a trend I’ve noticed lately: Manufacturers are moving toward more refined, all-purpose designs. High-end, even. What do I mean? Sleek. Black. Something you could probably use in the office without raising an eyebrow. This seems to be the latest design mantra for everyone from Razer to Logitech to Corsair. The days of the twenty-button mouse and “extreme” peripherals are over. Personally, I’m a fan. Barring the pervasive neon-green backlighting of the 2016 BlackWidow, this looks like your average, everyday keyboard. The typeface etched into each keycap is maybe still a bit too “Video Games!”, but otherwise this peripheral is one of Razer’s most professional-looking devices. Who would’ve guessed so much could be gained from eliminating five keys? Aside from ditching dedicated macro keys, the 2016 BlackWidow also overhauls the Caps Lock indicator panel in the top right. Well, the Caps Lock / Num Lock / Scroll Lock / Game Mode / Macro Recording panel. On both the 2014 BlackWidow and the BlackWidow Chroma, Razer finished this panel with some sort of translucent plastic. The idea seemed to be that you couldn’t see the indicators there until you turned one on. Unfortunately, reality didn’t quite match the concept. Illuminating Caps Lock or Game Mode or whatever caused a faint, blurry icon to appear. The “C” for Caps Lock was barely legible, the “M” for Macros looked like a busted McDonald’s sign, and the fuzzy “G-inside-crosshairs” (Game Mode) gave the impression that you should buy a better keyboard. Someone’s been listening to my complaints, because the 2016 BlackWidow Ultimate has a more standard light-up inset instead of the 2014 model’s translucent plastic. Now each icon is precisely stenciled and backlit, and the whole keyboard benefits. Again, it looks sleek and professional. Well, mostly sleek and professional. Maybe Razer could ditch the “G-inside-crosshairs” icon. But I’ll leave that for the 2018 BlackWidow Ultimate to rectify. Those two changes make up the bulk of the 2016 overhaul. The only other tweak I spotted is so small that it’s almost not worth mentioning, but the Function key now lights up. Don’t act too excited. The remaining features are pretty much identical to the 2014 BlackWidow—same fabric cable sheath, same diagonal cutouts in the lower corners, same media keys. And with the design having changed so little, that also means this keyboard still packs Razer’s own mechanical switches—the model we reviewed had Greens. I’ve come to accept Razer’s switches. I can work with them. But I don’t like them. In my opinion, they’re bargain-basement Cherry MX Blues. They require the same force to press as Cherry MX Blues (50 cN) and feature the same kind of clicky feel, but with a slightly higher actuation point and a lower reset point. This means you get a lot of resistance up front and nearly none after a key press registers. 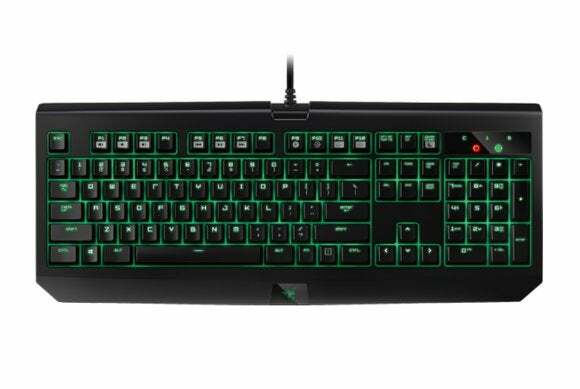 Razer claims this design is good for gaming: You can double- and triple-press Razer’s keys a bit faster than standard Cherry Blues. That’s great if all you do on your PC is games, games, games. But as I discussed in my review of the 2014 BlackWidow and as I’ve said on PCWorld time and time again: A keyboard is for more than just gaming. Presumably, you don’t want to drag a different keyboard out of the closet each time you browse the web, do your taxes, write the next Great American Novel, or what-have-you. However, no matter which keyboard you choose, you make compromises. I’d rather err on the side of comfort and use real MX Blues instead of worrying about shaving milliseconds off my double-taps (and bottoming out keys more often in the process), but that’s ultimately your call. As more manufacturers move away from Cherry switches in favor of cheaper alternatives, it’s becoming harder and harder to find a solid MX Blue board anyway. We’re two years into Razer’s “We’ll make our own mechanical switches” experiment and I’m still not sold on the idea. However, among gaming keyboards under $100, the 2016 BlackWidow Ultimate’s a solid choice and an improvement (however small) over its predecessor. You’ll miss out on all the rainbow-lighting craziness afforded by Razer’s RGB-enabled Chroma line but, well, maybe you didn’t want all those tacky lights anyway. It’s okay to admit it. Razer's 2016 BlackWidow Ultimate offers minor changes over its 2014 predecessor, but it's still a solid choice and all-around improvement.